Do you have any idea how hard it was not to just make this the headline picture? I’d rather we were still talking about Dustin’s 41-50 prospect list, and so do you, but instead we’re here talking about Chone Figgins, who signed a minor-league deal (along with an invite to camp) with the Dodgers today, his 36th birthday. Before we get to the lulz — and trust me, there are lulz — it’s probably important to recall that Figgins was once an extremely valuable player. Sure, he was only occasionally even a league-average hitter in parts of eight years with the Angels and three more with Seattle between 2002-12, but as an outstanding multipositional type (200 starts or more at second, third, and center, along with 17 at short, 24 in right, and 54 in left) who could run (seven straight years of 34 or more steals) and get on base (five seasons with an OBP of .350 or higher) he was the kind of guy who could provide value in a variety of ways, putting up 3.0 WAR three times and topping out at 6.6 WAR in 2009. But following that age-31 2009, Seattle signed him to a four-year, $36m contract, and it couldn’t have gone worse. After a mediocre first year, he was terrible in the next two, and the Mariners simply cut him loose with a year left on his contract (and a .227/.302/.283 line in 308 games) following 2012. He caught on with the Marlins last spring, but was released in March and sat out the season. Got it? Okay, now for the jokes. He reminded the scouts that even in limited playing time last spring, he was 8-for-26 with three walks for the Marlins, demonstrating that his skills were still intact. 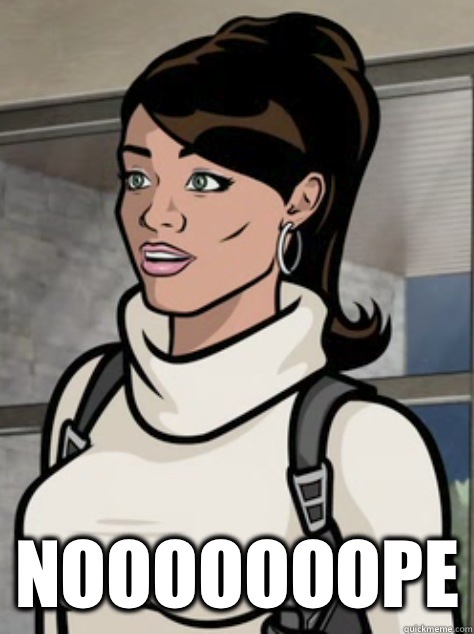 I don’t know why I’m on an “Archer” kick tonight, but Lana nooooppppe dot gif. Anyway, Figgins gets a crack in camp, and it’s not like the Dodgers don’t have a need. With huge questions at second base and no real backup to Juan Uribe at third base, he’s certainly found a place with opportunity. Whether he’s Anaheim Figgins, Seattle Figgins, or “gives a damn” Figgins will determine what he does with it. Next Do The Dodgers Really Need Another Starter?